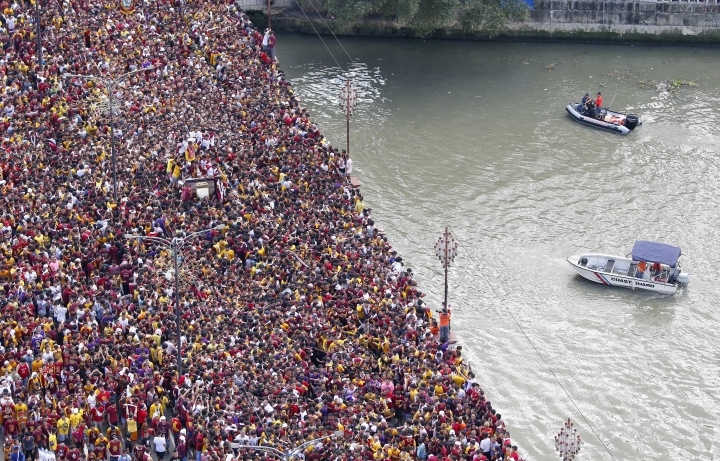 MANILA, Philippines — A mammoth crowd of mostly barefoot Filipino Catholics joined a raucous procession Wednesday of a centuries-old black statue of Jesus Christ despite terrorism fears and amid the president's attacks on the Catholic faith. 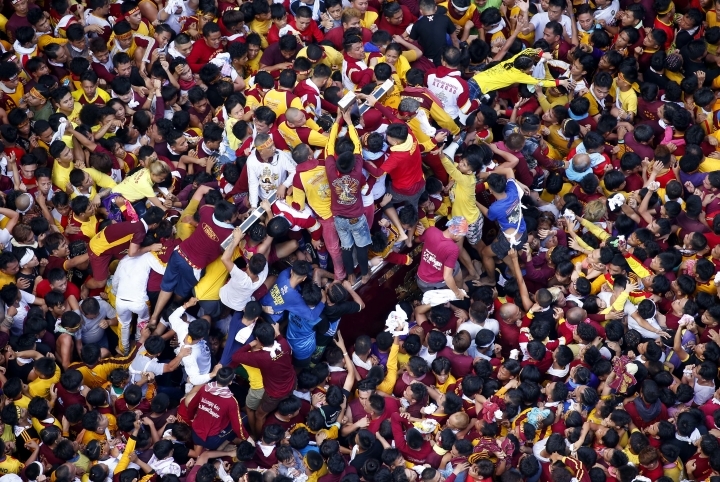 Police said they have not monitored any specific threat but that they deployed more than 9,000 police and troops, including bomb squads backed by a surveillance helicopter, to secure the annual procession of the wooden Black Nazarene along Manila's streets. 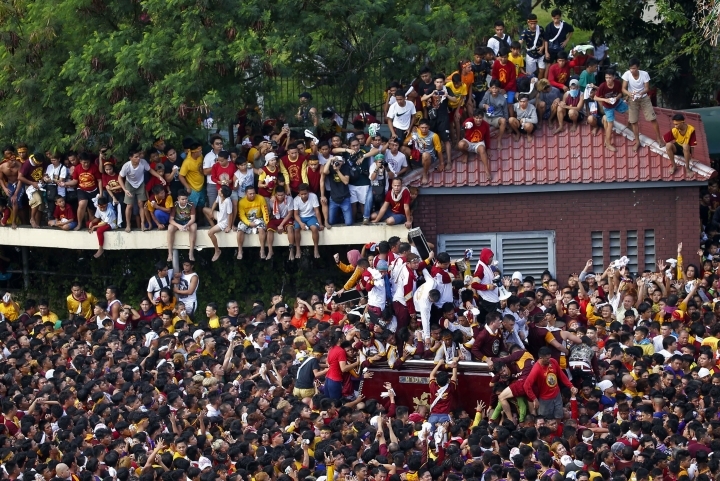 Police were expecting up to 5 million people to join the dawn-to-midnight procession. 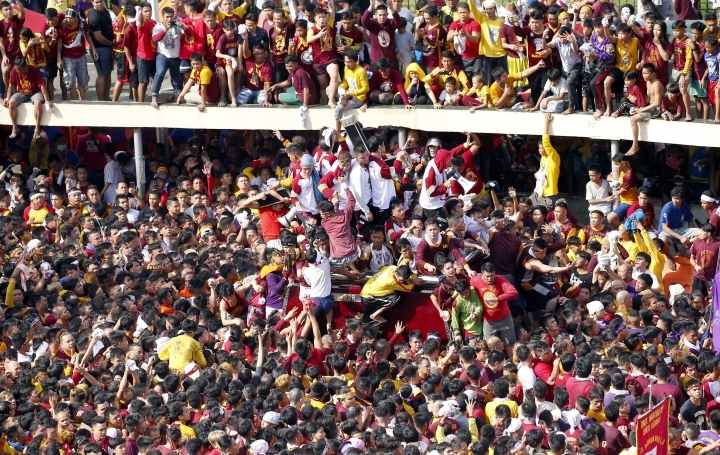 More than 800,000 devotees attended a Mass and the first few hours of the procession, national police Director General Oscar Albayalde said. 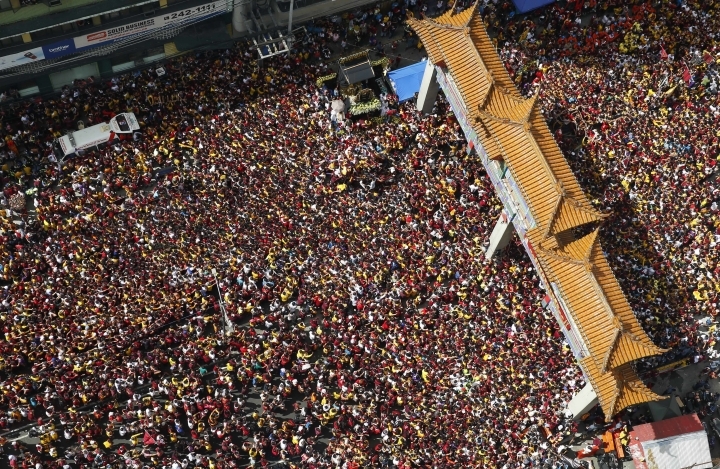 Tens of thousands of others joined in and went as one of Asia's biggest religious events unfolded. 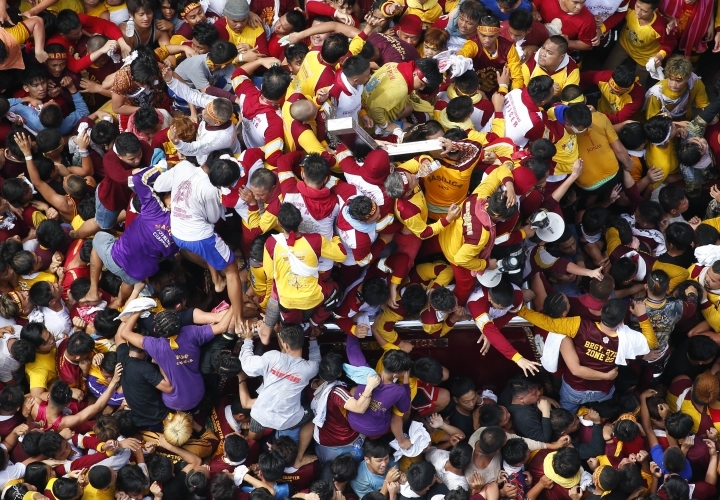 Despite the threats and the tropical heat, mobs of devotees in maroon shirts dangerously squeezed their way into the tight pack of humanity around a carriage carrying the life-size statue of Christ. 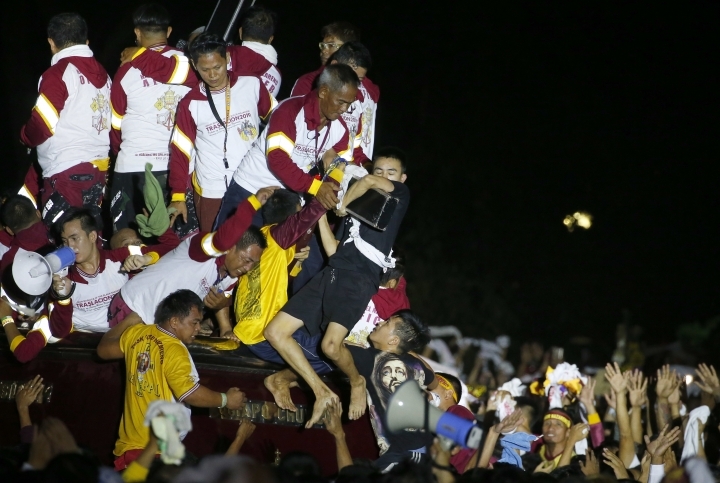 They threw small towels at volunteers on the carriage, which was being pulled by ropes, to wipe parts of the cross and the statue in the belief that the Nazarene's powers cure ailments and ensure good health and a better life. 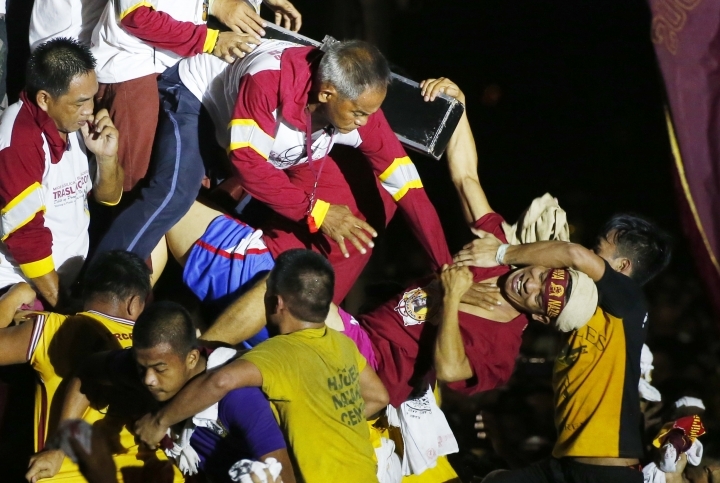 "I'm praying so I can walk again and be cured of depression," said Pochi Maximo, who held on to a wheeled walking device as she waited along a road with her daughter for the procession to pass. The 58-year-old housewife said she has joined the religious gathering since childhood as part of a family tradition and persisted to be at Wednesday's procession despite debilitating knee and spine ailments that were diagnosed last year, along with diabetes, that drove her into pits of depression. "It's very, very impressive ... It's a bit away from my way of thinking but I respect the people," said the 75-year-old engineer, who is a Protestant. 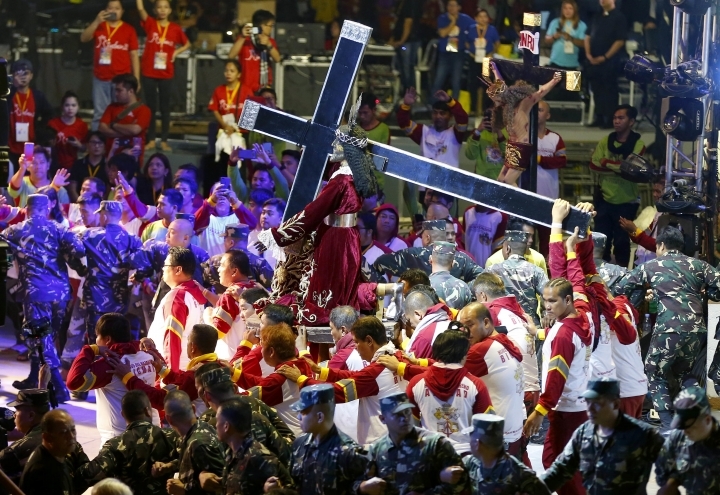 Such religious passion was under the spotlight amid President Rodrigo Duterte's stepped up attacks on the Catholic church, faith and bishops, who have criticized the thousands of killings under his anti-drug crackdown. In June, Duterte sparked outrage among many Catholics when he called God "stupid" and later questioned the basic tenets of the Catholic faith. He offered to immediately resign if anybody can prove that God exists. Crowned with thorns and bearing a cross, the Nazarene statue is believed to have been brought from Mexico to Manila on a galleon in 1606 by Spanish missionaries. The ship that carried it caught fire, but the charred statue survived. Some believe the statue's endurance, from fires and earthquakes through the centuries and intense bombings during World War II, is a testament to its powers. 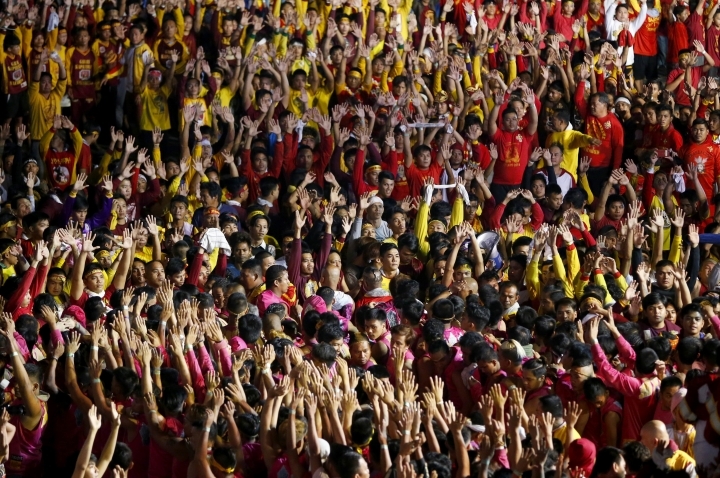 The spectacle reflects the unique brand of Catholicism, which includes folk superstitions, in Asia's largest Catholic nation. 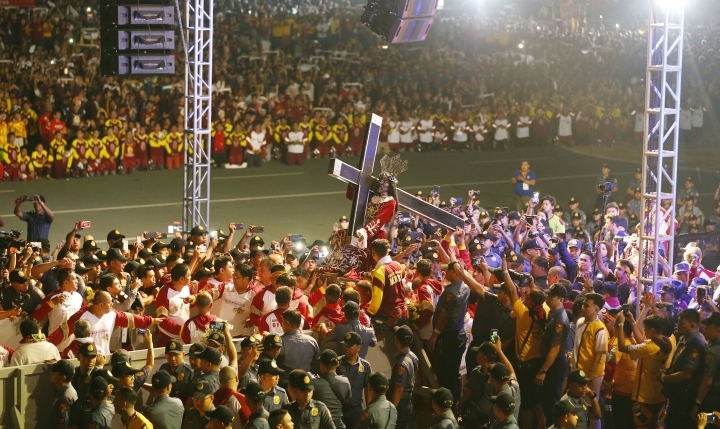 Dozens of Filipinos have themselves nailed to crosses on Good Friday in another tradition to emulate Christ's suffering that draws huge crowds and tourists each year. Police forces were placed on full alert ahead of Wednesday's religious gathering amid military offensives against Muslim militants aligned with the Islamic State group who have been blamed for a spate of bombings and other attacks in the volatile south. Last week, suspected Muslim militants remotely detonated a bomb that killed two people and wounded about 30 others near the entrance of a shopping mall in southern Cotabato city as people did last-minute shopping ahead of New Year's Eve celebrations.